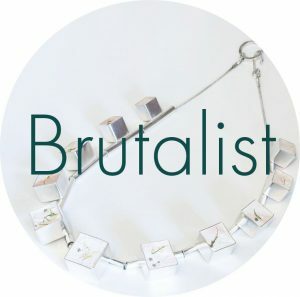 Definition: Brutalist architecture or Brutalism is an architectural style which emerged in the mid-20th century and gained popularity in the 1970s. It descended from the modernist architectural movement of the early 20th century. It is characterised by simple, block-like forms and raw concrete construction. Inspired by the shapes and elements found in the Brutalist architectural movement, Amy explores the different uses of the cube shape, whilst contrasting against the movement with soft curves. The predominant materials found in this collection are silver, cement, moss and resin coated moss. With this collection Amy continues to explore her interest in the relationship between small elements of nature and architecture and how they can work together to create a harmonious design.